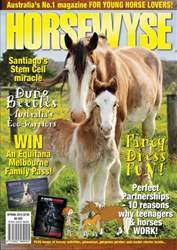 Inside our SUPER SPRING 14 issue of HorseWyse, we explore the brave new world of STEM CELL science and discover how this 'new age' technology is helping horses to heal. We meet a brave little mare named Sergeant Reckless, who became a US war hero..and we offer up 10 REALLY GOOD reasons why teenage girls actually DO need to own a horse! We dig up some dirt on dung beetles, plus we'll share eventing legend Sonja Johnson's theories on 'Crest vs Automatic releases' while jumping...Plus, with heaps of comps and giveaways inside, along with a HEATH RYAN COLLECTOR'S POSTER, you'll also have the chance to WIN a family pass to EQUITANA Melbourne OR Canberra's UNBRIDLED festival this November! From some extreme 'stick it' stunt riding, through to a 'spirited' horsey exhibition set to gallop around Australia later this year, our SPRING 14 issue of HW has it all!